Liliana joined INL in 2016 to work on the development of adsorption technologies for the recovery of metal ions from industrial wastewater. She holds the degree of Integrated Master in Biological Engineering (2016) from the University of Minho. During her Master’s thesis she worked at INL, focusing on the synthesis of magnetic nanorods and their coating, physical and chemical characterization, and biofunctionalization for hyperthermia applications. 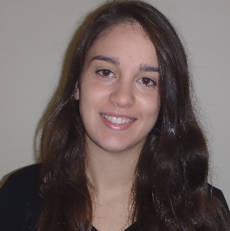 While being a student, she took part in two research projects at the Biological Engineering Department at the University of Minho, related to effluent treatment with generation of energy and nanoparticle development for drug delivery applications. Faria, A.; Gonçalves, L.; Peixoto, J.M. ; Peixoto, L.; Brito, A.G.; Martins, G.
Resources recovery in the dairy industry: bioelectricity production using a continuous microbial fuel cell. J. Cleaner Prod. 2017, 140, 971-976.